Serbian History 101 - SNF/St. George Cemetery/Petrov/Marich/etc. 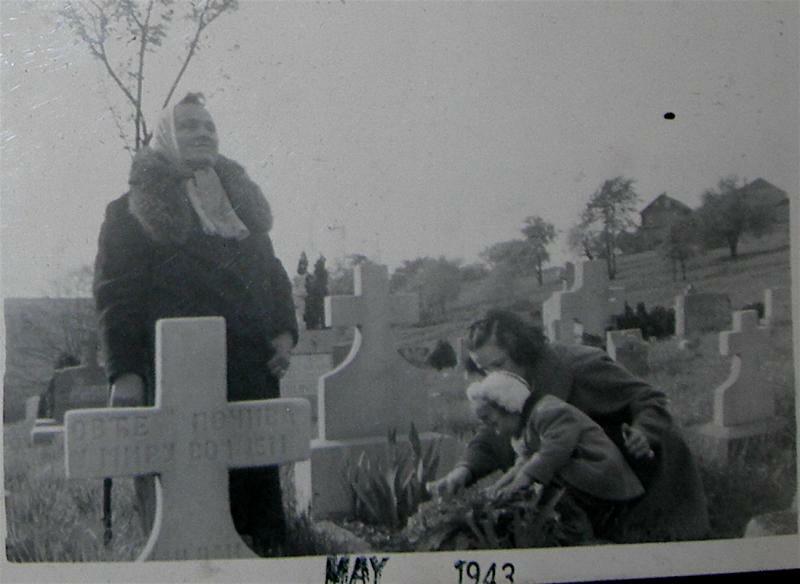 "At the St. George Cemetery in Pittsburgh, PA"
+Andja Mamula, steadfast SNF pioneer and her daughter, +Martha Mamula Belosh, with Marty's niece and Andja's granddaughter, Milana Mamula Karlo Bizic, 1943 at the St. George Serbian Orthodox Cemetery in Pittsburgh. Both of those tending to the graves were SNF "Women of the Year" (Person of the Year). by Aleksandar Petrov, a poem published in the booklet THE STONE AND THE BELL, a publication underwritten by the 100th Anniversary Cultural Fund of the Serb National Federation, July 2001. The booklet was dedicated to Jovan Bratich, long-time Serbian section editor of the AMERICAN SRBOBRAN. Since 1993, Serbian Section editor of the American SRBOBRAN. Dr. Aleksandar Petrov is an amazing person of academic intellect, an outstanding poet and novelist whose works have been printed and translated widely in many countries, including Britain, Spain, Sweden, China, Taiwan, Japan and the USA. He was born in Nis, Yugoslavia, but received his Ph.D. at the University of Zagreb. He has published over 20 books of literary and scholarly works in history and literature of Slavic Studies. For many years he was the Senior Research Fellow at the Institute of Literature and Art in Belgrade, where he also served as Director of the History and Literature Departments. LIKE GOLD IN THE FIRE is one of Petrov's books that was excellently reviewed by Olga B. Markovich, of Toronto, Canada. Olga was also an SNF "Woman of the Year" for her unending research on the Serbian people of America, Canada and Serbia. Ned Marich is gone. Died July 25, 2009, but I refuse to let his great deeds go to the grave with him. He wasn't buried at St. George Cemetery in Pittsburgh, rather in Indiana, where he lived. However, he belonged to all of us who cared about what happened the last 20 years in the former Yugoslavia. Ned was an educator, who taught in the Gary Public School System and the Cedar Lake School District at Hanover Central. But even after he retired, he continue to educate Americans about the truth of what was happening in Serbia through various newspaper articles and editorials he wrote. He's another of those Bosko Yugovich heroes, carrying the flag and fearless to the end. Ned J. Marich was born on March 27, 1915 in Gary, Indiana to Jovo and Gosa Marich, who came to America at the turn of the 20th century from Trebinje, Hercegovina. He was a devout member of his St. Sava Serbian Orthodox Church in Merrillville, Indiana, serving 13 years as the church's Serbian translator secretary. Throughout his lifetime, he was generous to the church and Serbian organizations, like the Serbian National Defense Merrillville Chapter, where he was past-president and a delegate many times to the national S.N.D. national conventions. He was a dedicated member of the SNF King Peter II Lodge 16. But what made Ned VERY special is that he was one of the original SNF stipendists awarded a scholarship to study in Belgrade. That year, the SNF selected 9 of the brightest students throughout America to earn a degree from Belgrade via scholarships. A strong believer in education, in his will, Ned, in gratitude to the Serb National Federation for sponsoring him to study at the University of Belgrade in 1934, left upon his death a $13,000 donation to the current SNF Scholarship Fund. Ned wanted to be able to give SNF members and opportunity to further their education as he did.